Finding ways of how to make bunting can seem difficult. There are many different ways to making bunting and each way gives the same effect. The difference between then will be how long the bunting will last. The flags can be made out of paper and glued or stapled onto the ties, felt can also be used. The type I like to make is out of fabric and sewn together as this will give you a long lasting decoration or a reminder of a wonderful day. The flags are made individually and are usually triangular in shape for the traditional style. Other shapes could be used as well if it is made for a particular occasion. Heart shaped ones could be used for a Valentine party, Stocking shaped ones for Christmas and bat shapes for Halloween. The size of the shapes is a matter of choice and depending on where it will be used. Ones for the garden or outside could be a little larger than those used in the lounge for example. They could even be tiny if decorating a dolls house but that could be a bit fiddly. There is such a wide variety of fabric available in shops or on line retailers. These have prints for all seasons and occasions. Your bunting can also be personalised by adding felt letters when it is made. This is a lovely gift to give. Decide on your shape and then make up a pattern to the size required. Place your pattern onto the fabric and cut out with pinking shears to stop the fabric from fraying. Cut out the number of shapes for the length you want. Attach your cut out shapes to tape keeping a gap between each of the flags. It may be an idea to have a length of tape without any flags on it at the start and finish to attach your bunting securely. If you don't want to use pinking shears, turn under the sides of the flags to make a narrow hem either single or double to hide the raw edges. Sew with the machine or hand. The flags could also be made double sided. Two pieces of material will be needed for each flag, place them right sides together and sew a narrow hem along both sides. Turn the flag right side out, press and if wanted you could top stitch along the edge of the sides. If the top edge is going to be seen then this could be turned under and also top stitched closed. (B) the top could be folded over and sewn so that a length of cord or tape could be pulled through. The only downside to this way is that the flags would be free to move and possibly all bunch together. 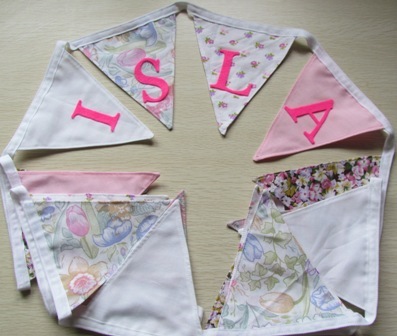 The flags use for the baby girl bunting were 6 inches (15cms) wide and 6.5 inches (16.5cms) long. They were sewn double sided and top stitched to secure the sides. These were sewn to the tape with a 1 inch (2.5cms) gap between each one with a 12 inch (31cms) length at each end to secure. I find that this is the way I like the best. There are different ways in how to make bunting but when making bunting in any of the above ways you should be able to reuse it again.